Feemwlort - ZineWiki - the history and culture of zines, independent media and the small press. Other contributors included Buck Coulson (Yandro), Dave Locke (Awry), and Bjo Trimble (Pas-Tell, Melange). Art work was contributed by Fred Hollander (Hippocampelephantocamelos), and Bill Reynolds, among others. 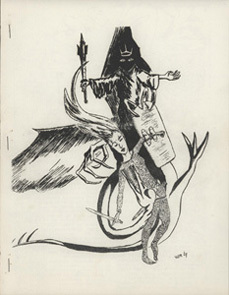 Greg Shaw was simultaneously publishing Entmoot, a publication devoted to Tolkien and his writings and, and his music fanzine Mojo-Navigator Rock & Roll News. He went on to publish Metanoia with Suzy Shaw in the 1970s, and his best known publication, Bomp!. This page was last modified on 16 January 2016, at 17:49.